“Power Lists” are the pre-Buzzfeed listicle that publications fall back on when they don’t have enough news for an actual story. They’re an arbitrary list, comparing people in different professions, walks of life, levels of influence, and giving them a ranking that can’t be justified. Having said all of that, as I watched the council debtate over the Town Hall last week, I couldn’t help but think: Lianne Dalziel is now the most powerful person in the city. In ordinary circumstances, it might not be a surprise that the Mayor is the most powerful person – but these are no ordinary circumstances. Gerry Brownlee has dominated the political environment in the city since the quakes, completely emasculating the previous mayor, sidelining any opposition MPs, and marginalising his ultimately doomed Chief Executive Roger Sutton. But the decision over the Town Hall may be the point at which we look back and say that the Council took back the power. Brownlee’s grasp on the city has been waning since before the last election. During the campaign, the Prime Minister announced that CERA was to be brought within his own Department of Prime Minister and Cabinet – a sure sign that Key and English no longer trusted Brownlee’s handling of the recovery. While Sutton departed under a cloud, we’ve also seen a number of other high profile exits – Warwick Isaacs and Reid Stieven have also left CCDU and EQC, respectively. Post-election, Brownlee was also given the Defence portfolio, which has been an important but low-profile Ministry for some time. His handling of the deployment to Iraq has been a return to the cartoon buffonery that he was associated with pre-quake. I’d argue that his behaviour in the defence portfolio – arrogant, ignorant, bullying – is no different from his rule over the recovery. The difference seems to be that while he can get away with it in Christchurch, he can’t pull the same tricks in full view of parliament and the Press Gallery. On the Town Hall, Brownlee has shown the disdain he has previously expressed for heritage buildings. He remarkably dismissed the independent report into the facility, whilst admitting he hadn’t read it. Back at the Council Chambers on Thursday, and Mayor Dalziel cross-examined her own council staff who presented the report, showing that not only did she read it, she understood it. She understood the heritage, the cultural, the environmental, and the financial implications of the decision. She could see that a full restoration of the Town Hall was the right call, in spite of the campaign from the Press, who repeatedly used their editorial and opinion pages to present a very one-sided case against it. Her experience and determination moved the windvanes of knee-jerk reaction – with two former talkback hosts sensing the changing breeze. Concillor Ali Jones voted for restoration, whilst her former NewstalkZB colleague Mike Yardley wrote on Friday that he too had become a convert after watching the Mayor’s performance. This is but one decision, but bodes well for the campaign to bring control of the city back to the people who live and work in it. At the end of the month, the “transition plan” will come up for discussion. And there may be a transition of another kind; rumours abound that David Carter may be relieved of his terrible reign in the Speaker’s chair. The bad news is that his replacement may be none other than Gerry Brownlee. If this did come to pass – probably not before late this year or early next – then it would be left to Nicky Wagner to turn the lights out at CERA. It is into this void that Dalziel and her council are reaffirming their role as the primary determinants of the broken city’s direction. While the big news with regard to the rebuild has been the scaling back of the Arts Precinct, this is just one part of a wider narrative that sees the grand plan unravelling. Since I wrote my column in the Herald at the weekend, we’ve had the news that Antony Gough’s Terrace Project is taking a wee break, that the Arts Precinct is being scaled back, and that the CCDU is paring back it’s land acquisition. These stories illustrate the point that I made on Sunday; that the rebuild is happening outside of CERA’s control, and that the Blueprint hasn’t worked in the way it was meant to. The Arts Precinct announcement has been a long time coming. The original plan depended on the Town Hall complex being knocked down, so that the money from it’s insurance payout could be use for this new precinct. Once the council had resolved to restore the Town Hall – which was in August of las year – the rest of the project was always going to have to be scaled back. It is just a shame that CERA’s thinking wasn’t made public earlier, as it could have helped inform the debate around the Majestic Theatre. A restored Majestic could have* brought a beautiful building with a strong cultural history back into the discussion about the wider arts community’s needs. Instead, the demolition proceeds regardless. However, the arts precinct has other hurdles to surmount – the Court Theatre, Symphony Orchestra and the Music Centre are pivotal tenants and they have indicated they cannot afford high rentals required in new buildings. I’m not sure where this leaves the project. If the three key tenants of the project have indicated that they can’t afford the rent for a new building, then what is the plan? If we (the council / the government / both) are going to have to subsidise the rent for these tenants, isn’t that a discussion we should be having? It may be that the arts fall victim to Brownlee’s land-grab, which has pushed the land prices in the central city to a point where they can’t afford to be based in it. At this point – almost two years after the plan was released – I think it would be a good idea for the involved parties – particularly the CCDU and the cash-strapped Council – to have a bit of a stocktake of where the Blueprint has got us. Best-practice planning means that things aren’t set in stone; strong leadership means making the tough calls about changing direction, rather than just ploughing on regardless. It is not too late to reconsider some of the anchor projects in the plan. If I was to sum up my critique of CERA in the shortest way possible it would with this one sentence: ‘Is that what you meant?’ This sentence is a critical part of any complex process. A person asks their opinion on something, they formulate that opinion into another form – a document, a design, a proposal, a sketch – and then go back to them and say ‘This is what I have done, is that what you meant?’ What normally then follows is a complex, intriguing, and difficult conversation where the questioner explains all the reasons that it is turning out this way, and the questionee reflects on what are the more or less important parts of the original answer. There is iteration, compromise and new ideas are formed. This is precisely the process that has been missing in the redesign and rebuild of the central city. The people had a say during the “Share an Idea” process. For the government this is the end of it. They seem to have taken to heart the joke that ‘Democracy is the theory that the common people know what they want, and deserve to get it good and hard.’ (H. L Mencken). I don’t particularly believe that people, as a whole, know what they want, but I also don’t think the government or any of the shipped in advisors know either. However, it would be nice if we (and others like the representatives of those that can’t speak) were included in the conversation. That would be the first step. Over the past three articles I’ve tried to articulate that not including the public is dumb politics that leads to dumb design, but I’d also suggest that it is dumb economics. The financial meltdown that rocked the world in 2007-08 hinged on a number of Wall Street firms developing stock options so complex that it was impossible for investors to have any understanding of what was in them. The heavy reliance on these options that turned out to be dodgy compositions of bad loans was what brought the banks down so quickly. This could not have happened if the market could see what they were investing in. It would seem that both democracy and the economy rely on transparency to function. And if so, is the complete failure of the government to attract international investment into their rebuild project partly to blame on the opaque government structure that is developing the new city? We have stadiums, conventions centres, justice precincts, and many other government-led projects emerging with no publicly available business cases behind them. Should we be surprised that this isn’t creating investor confidence? If CERA won’t even release their organizational structure, how are we are supposed to trust them with rebuilding a city? 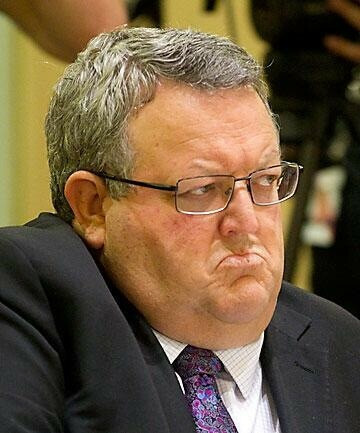 Over the holidays it struck me that Minister Brownlee’s unfortunate health problems have inadvertently removed the most effective metaphor to describe the performance of post-quake CERA; being an overweight, top-heavy and opaque bureaucracy that develops its own internal inertia which logic and common-sense can’t budge. I’ve repeated this idea enough times now, and figure its probably getting pretty boring. So to finish this short series of 4 posts I’m going to briefly comment on each of the so called anchor projects. In our upcoming book (released October this year) we will have a much closer look at the logic that is guiding the focus on anchor projects (anchornomics) but for now I’d like to do a David Killick-inspired update of the good and bad of the projects as they are at the moment. Killick has a regular feature article in the Press called Design Matters which presents an extraordinary opportunity to communicate the depth and beauty of matters of design, yet Killick has developed a design-lite approach to writing that raises important issues in poetic lists without any sort of explanation or context. One friend said if you read it out loud it sounds like Ralph Wiggum from the Simpsons. I covered this in the last part of this series here. Great idea, poor process. Will probably come out ok, but well short of the extraordinary potential this project offered. I don’t know the details of this, but there is significant funding in place and they have hired some of the most competent and experienced designers in Australasia for this project, so looking promising. The building isn’t going to change the world, but the project is based on a really sound idea that emerged from the post quake experience – to keep ministries and departments close to each other. So this building will have emergency, courts, corrections and other departments all in one area. Reports are that it is going well and looks promising on both an urban and organizational levels. Too big and too expensive. Do we really need to spend another $50 – $100 million on a stadium just for a couple of Lions Tours? Crazy stuff. A small and well-designed stadium might work this close to the city if carefully arranged, but anything as big as proposed should stay where it is. This is the most dangerous project for the city. It occupies two large blocks in the heart of the city. I don’t know of any other city that thinks it’s a great idea to stick a monolithic project with an internal focus at the centre, its normally much smarter to put it on the edge so it can do its own thing, but close enough that the business of hotels and restaurants and cafes feeds into the heart. The original proposal that was given to the designers was for a convention centre 4 times the size of the previous one (this is apparently now being reconsidered.) The key with this project is to keep the edges alive so that no part of the city is destroyed by parking, entrances, storage and the sides of large internal spaces; it is hard to see how this can be done on four edges, so will inevitably kill at least one street in the city. This is a really big project and there has been no information released on it yet. Like the convention centre and the Avon this is big stuff. Do this badly and the whole inner city rebuild will be compromised, do it well and Christchurch could easily become the best city in the country. What was originally conceived of as a land bank and edge condition to the city, got sold to the public as a park, and it now being conceived as the only real opportunity to get twenty thousand people into the city. This is potentially game changing. We could see the design and construction of the first 21st century housing in NZ. Meaning proper density, sophisticated design, integrated transport and ecology, and at affordable prices. Instead it sounds like treasury is leaning on CERA to get some money back from the expensive land purchases, so are pushing for the land to be sold of to the highest bidder. This’ll inevitably be the groups that can make the most money out of the projects, and sadly this isn’t like to lead to the best outcomes. Government needs to lead these projects so it caters for a diversity of residents (this is what makes cities work) and to use the scale of the construction to develop new safer cheaper offsite manufacturing. So again, there is hope, but I can’t see why this government would see the light on this issue when they haven’t so far. This project is a joke. It was introduced by Minister Joyce at day 93 in the 100 day plan. It’s been under-developed and under-supported. It represents the worst of government interference. Leaving people to just get on with their own buildings would have been many times more effective. Who knows how this will develop from here, but the horse has already bolted. Key players may now be the centre of an exciting development elsewhere on the edge of the city. Nice idea, but again caught up in the rubbish from the British designers. I can’t for the life of me work out why the playground can’t be constructed around the centennial pool and Elsie Locke Park instead of necessitating their demolition. I’d ask CERA and the CCDU, but that’s right, they don’t talk to the public. This one is a doozy that has been drawn into the controversy of the Town Hall. Now that it looks like the Town Hall is staying (thankfully) the rest of the arts precinct can start to be conceived. There is around $40 million and a large piece of prime central city land to do this. At the moment this will cater for CSO (who were going to get a new building pre-quake), School of Music (who are bringing in their own money) and Court theatre (who get another new theatre). I have followed this project closely and can’t for the life of me work out why there hasn’t been a proper consultation process to work out what goes in this area. What about youth spaces? What about community access? What about a BATS-sized theatre space? The Court Theatre is obviously important, but I can’t understand why they get some $20 million of rate payer money without a public conversation. There is heaps of land here that the government is gifting to this project my two cents would be to encourage more groups to come in and make this a dense and amazing collaboration of spaces and groups. Other thoughts are that the James Hay should be substantially reconsidered so that it becomes a loved part of the city. There should be a small but beautiful bridge built from Victoria Square to the southern entrance of the Town Hall, and finally that the whole Arts Precinct should go on the site next to the river between Colombo and Manchester. I don’t really know much about this project. It’s another big one. Sounds like some of the master planning is quite exciting. This is an interesting one. The old library would apparently only take $8 million to fix and instead a new $90 million library is being built one block closer to the square. The idea of having a contemporary and great library on the square is a strong one. Or they could spend $30 million the old library to fix and it and built a new contemporary area. However CERA (as with the centennial pool) won’t let this happen because the old library is on the site of the new GIANT convention centre, so MUST be demolished. I’m in two minds about this as it would be amazing if a really good design is built right on the square. How about an international design competition? Another good idea, great to see CCDU and CCC working so close together. This project illustrated the importance of public competitions with a fantastic array of entries from around the world. The 4 short listed entries were actually quite exciting. The project has however now become mired in economic issues as the government is allegedly trying to get ‘market’ value for the land and thus making the whole project unfeasible. I’m not sure how a ‘market’ value is reached in the middle of a city so dominated by a government landlord. This is supposed to be a demonstration project, be good if it was demonstrating amazing and affordable design rather than demonstration why we can’t ever build anything decent in this country. While the Re:Start mall has been a great success and illustrated the importance of quick and experimental thinking, the retail precinct has illustrated the opposite. A similar story to the innovation precinct but on a bigger scale. Nothing has happened here in the 18 months since the 100-day plans were launched. Dozens of designs have been proposed, millions will have been wasted of fees, lawyers, accountants, QS’s, and other professionals. The project does at least illustrate how we aren’t being victims to disaster capitalism, but rather the much more mundane reality of incompetence and bureaucratic obstinacy. Now, belatedly the government has thrown up its hands and done what they should have in the first place and said to the land owners ‘fine do what you want then but here is a master plan you need to fit within’. Apparently some pretty good architects have now being brought into the camp to do this master planning. This is a bit of a phantom project. Rumours are that it just isn’t going to happen. The piece of land that it was designated for was a bit strange in the plans, so I reckon it’d be better put someone more centre, either on the current site of the commons (where the pallet pavilion is) so it really feels like the entry to the city, and over the river from market square/Victoria Square, or next to the Avon where the new arts precinct was originally going to go, or if the old library was kept this building could be put on the square as a sister building to the cathedral. I’m not sure what it is supposed to be, but it feels to me that Ngai Tahu should be more present in the centre of Christchurch. What this list clearly illustrates is repeated point about involving the public. All the projects that don’t have the public as the main user group have done well. The Health Precinct and the Justice and Emergency Precinct both have strong clients who can formulate their needs and work with the designers to achieve them.The River, the east and south frames, the arts precinct, Cathedral Square, the innovation precinct are all going awfully because the main user group has been ignored, or has had no proper representation. Looking outside of the Anchor projects to what is actually happening in the city I predict another long, blur of a confusing year. There’s going to be some BIG political battles this year around the election and locally with the cost-sharing agreement. The city itself is going to suffer from a lack of intermediate initiatives. It’s looking like both the pallet pavilion and Re:Start will be gone by April* without anything in the pipeline to replace them. This should be the moment when projects such as the Arts Circus should be in full swing. People need to realize that the big projects are still years away. A few great things like the Isaac Theatre and parts of the Arts Centre will begin to come online, but really the big projects haven’t even finished master planning, lets alone proper design, let along construction and opening. We are in this for the long haul. 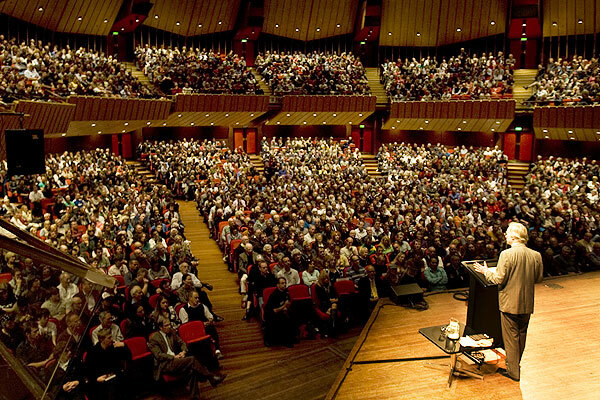 The Christchurch Town Hall does not belong to the arts community, it belongs to everyone. The Christchurch Town Hall was not built to just cater to the needs of the CSO, the Court Theatre or any other segment of the community who might want to do jazz hands. It is a civic building, built to cater to the many and varied needs of all of the people of this city. Paul Lonsdale is the most serious contender for Lianne Dalziel’s bid for the mayoralty, but that isn’t saying much. He should be taken about as seriously as Shane Jones’s bid for Labour leader – not going to get anywhere but will boost his profile. It will probably see Lonsdale elected to council in Hagley-Ferrymead, though that would be a shame, given how little he seems to understand things. This decision should not have been for this current council to make. If elected as mayor, I would gauge the views of the new council and we may see a completely different sentiment. Now, this reflects the line that the Minister and the Press have been pushing, but it’s crap. Why should the decision have been taken away from the current council? For no apparent reason apart from the fact he doesn’t like the decision that was made. The council had plenty of information. They had been discussing it for more than a year. What is the role of elected councillors if not to make decisions? If they should have deferred this decision, then why not any other decision? Why don’t they just give everything up, go on holiday and defer all decisions to the next council? Or the one after that? Personally, $127m is far too greater cost and places the entire performing arts precinct at risk. Places the entire performing arts precinct at risk. Sorry, what? Places a hypothetical precinct that only exists on paper at risk? Come off it. We didn’t have a “performing arts precinct” before the quakes, so complaining about it being “put at risk” rings hollow to me. The architect is still alive so we would be better to engage him to design a new Town Hall on better and safer land right in the heart of the performing arts precinct. Sir Miles Warren is well into his 80’s, but we should go against his will (he made personal submissions to save the Town Hall at council), knock the building down and then ask a man in his 80’s to redesign something new? Seriously? The cost to do this is about half the cost to restore to the current town hall. 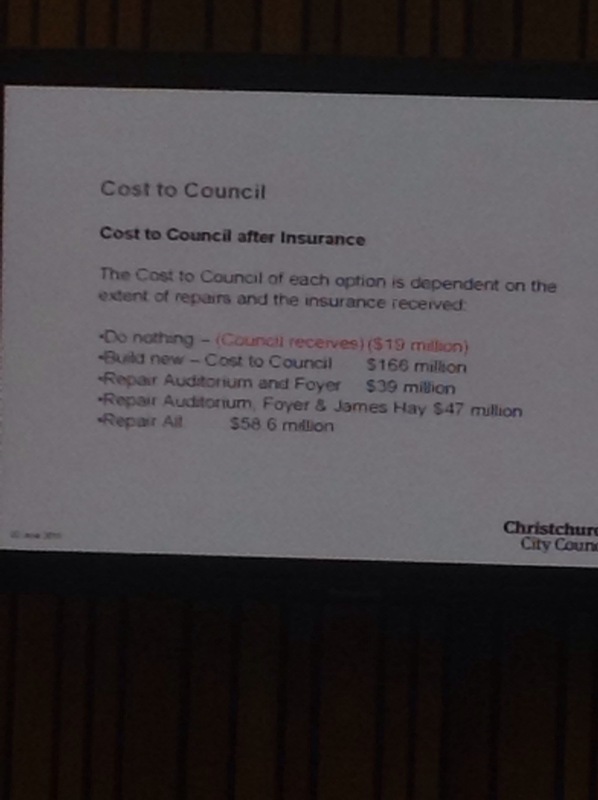 So Lonsdale thinks you could build a new town hall for ~ $60 million – half the cost of restoring the current one. Any evidence of that? No. He has a picture of the National Centre for Performing Arts in Beijing; cost to construct – $600 million. Tomorrow morning, the City Council will vote on the Town Hall. I hope that they do the right and and vote for full retention – as they have done in the past. In the past couple of months, the Minister – aided by the Press – has waged a fairly unsavoury campaign to undermine the arguments for retention. Barnaby Bennett has documented some of that in his latest blog post. In the last week, the Press have run two opinion pieces from people in the art community – as well as one from Jane Bowron, who has transitioned gently into full-on middle-aged crank and shan’t be considered along people who could be argued have an informed opinion – who want the auditorium retained, but the rest of the facility pulled down. These two people represent interests that would / could / might benefit from having the James Hay pulled down. Felicity Price has been on the board of the Court Theatre, CSO etc. Luke Di Somma is a conductor. Both argue that the James Hay is not fit for purpose and should be pulled down. While they have an argument about the use of the James Hay, I don’t agree that it should be pulled down. Firstly, it doesn’t suit the purposes that these two people represent; for Price, the Court Theatre, and Di Somma, musicals, opera etc. But who said it had to? For one, the Court Theatre is a professional theatre that has established a new facility in Addington; of course, before that it was in the Arts Centre. I’m not sure at what point it was decided that the Ratepayer was building the Court Theatre a new facility – and if that was ever voted on (it wasn’t) then was there an agreement to demolish a building with a civic function, and reallocate the resources to a professional group? No, of course there wasn’t. Though perhaps after the Hagley Oval decision, the Court were emboldened by CERA’s decision to reappropriate public assets for the commercial use of the few. This is based on the legally questionable idea that the insurance money from the Town Hall can simply be transferred to a new arts precinct. Secondly; Price has drawn up a long wishlist of things that she reckons you could get for the $80 million. Looks good on paper, but it hasn’t been costed and I doubt that it is in anyway realistic. The central library is budgeted to cost a whopping $85 million – so I find it very unlikely that even half of this wishlist would be affordable. The worrying – and I think quite real – scenario would see the council vote for partial retention, only to find that they’re only left with $40 million after the auditorium is fixed, and that’s only enough for a severely compromised performing arts hub. Is that worth destroying the architectural unity of what is the most significant building still standing in Christchurch? The final point that these people – and indeed, the Press editorial team who seem to have taken the Minister’s talking points to heart – miss, is that the Town Hall is a Civic facility, not just an arts facility. While it was used for concerts and orchestras, it was also used for conferences and Cantamaths, school choirs and music festivals. It was also used for union meetings, church meetings, political meetings. The last thing I went to in the James Hay was between quakes, when the council called a meeting for central city property owners who were worried about their buildings. It is central, it has plenty of seating and in that situation, no-one was complaining about the acoustics or it not having the right lay-out backstage. It is the Town Hall. What Gerry has done has looked at all the assets on his book – cos it is his book at the moment, even though we own it – and tried to find the places he can scrounge money. By knocking down the James Hay, he’s taking a civic asset, and giving the money to people with commercial interests in the arts. That that in itself is no longer outrageous shows just how far removed this rebuild has got from being moral, just and equitable. UPDATE: Luke Di Somma would like it to be known that his misguided views are all his own, and that he doesn’t represent anyone but his own interests. Glad we cleared that up.